It’s Thursday, which means we are almost there people, just hang on! 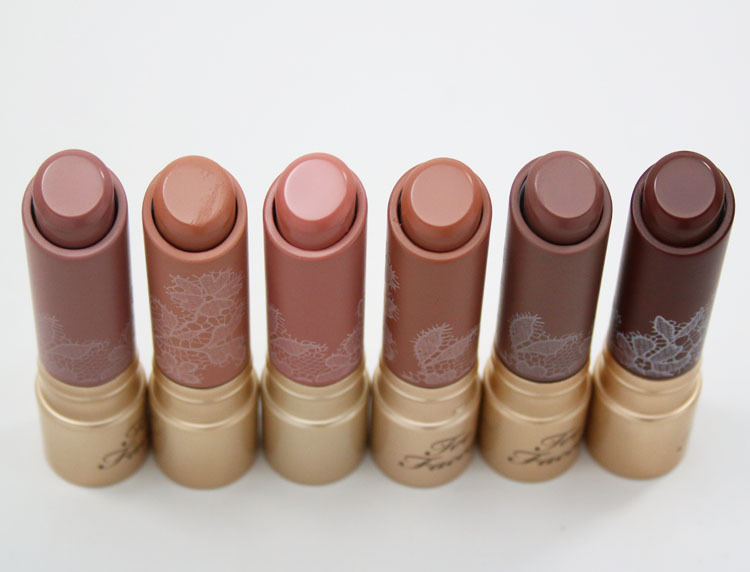 Today I have some of the Too Faced Natural Nudes Lipstick shades that recently came out. There are actually ten shades in total, but I have six to show you now. These lipsticks are infused with coconut butter to help lips stay hydrated, and they smell like coconut as well (lightly). They have a really smooth and creamy lip balm-like texture, but are actually very pigmented. I somehow expected these to be sheer but was very pleased with how much pigment they had! The caps are designed with a lace-like motif, and the colors match the color of the lipstick inside. Overexposed is a medium pinky/beige. Skinny Dippin’ is a light tan. Birthday Suit is a medium brown/tan. Nip Slip is a medium warm caramel brown. Throwin’ Shade is a deep cool taupe. Indecent Proposal is a dark cool reddish/brown. As you can see, these are nicely pigmented. They really feel more like a lip balm than a lipstick, and of course I love that because I always have dry lips. 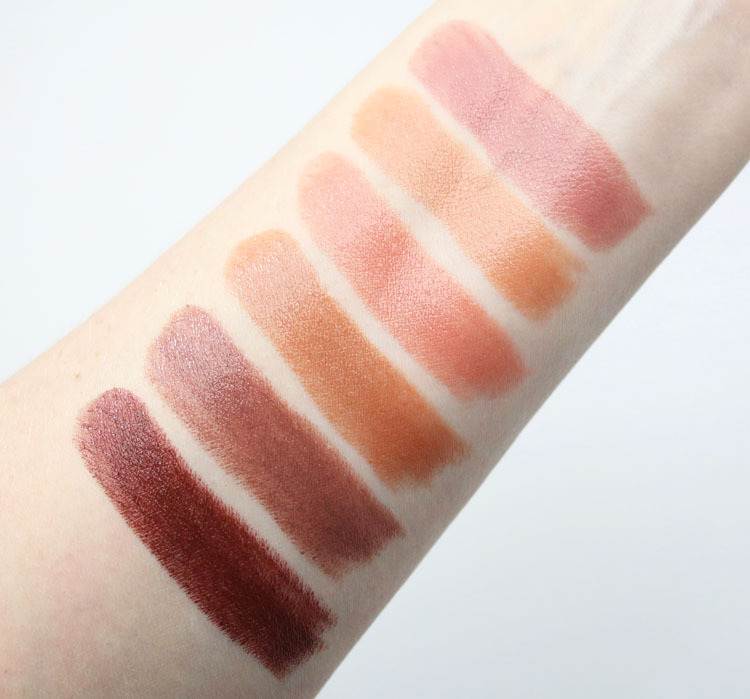 Most of the six I swatched are warmer toned and I prefer cooler ones, but other than that, I have no complaints! Oh the coconut smell is very mild and to me it doesn’t really smell much like coconuts. 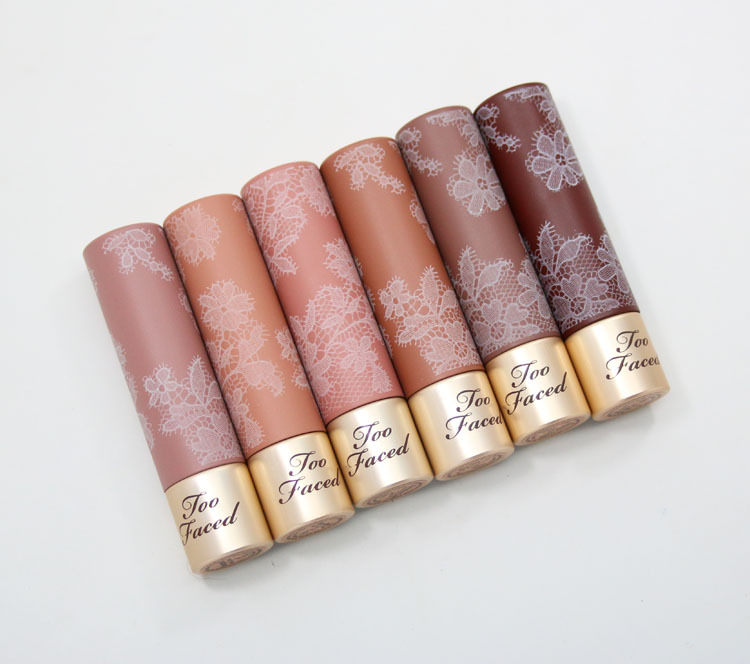 You can find Too Faced Natural Nudes Lipstick at Sephora, Ulta, Nordstrom and elsewhere and they are $22.00 each. I like nudes but I would probably only try the one that is more pink. Totally understand, I feel the same way. Overexposed is exactly the kind of shade I wear every day for the office, so I think I’ll give it a try. Thanks for the swatches, you make life so easy for the girls who have to order things online!